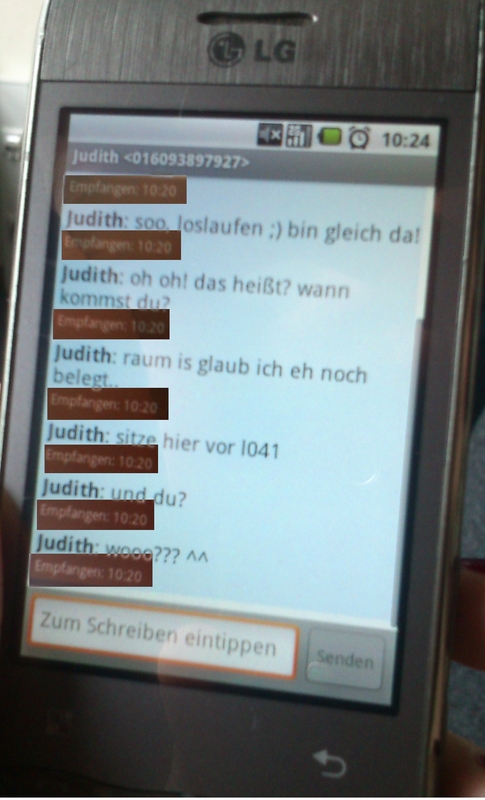 Fast jeder hat heutzutage eine SMS-Flat. Mal eben schnell eine kurze Nachricht an den Freund, an die Freundin oder an die Familie, einfach praktisch. Jedoch nur, wenn man auch eine Antwort bekommen kann. Dies ist seit einigen Wochen bei mir leider nicht mehr der Fall. Oft bekomme ich Stunden- oder sogar Tagelang keine Antworten auf meine SMS. Anfangs dachte ich mir wenig dabei, viel beschäftigt und im Stress sind meine Freunde vielleicht?! Aber das so wirklich niemand schrieb, war dann doch komisch! Als dann immer mehr Leute fragten, warum ich nicht antworten würde, war mir schnell klar, irgendwas stimmt mit meinem Handy nicht; SMS kommen nicht mehr an. Doch dann, einige Tage später, piepte mein Handy wie verrückt und 43 SMS auf einmal kamen an. Damit dachte ich, das Thema wäre erledigt.Vor allem da das Fachpersonal im Base-Laden auch keinen wirklichen Rat wusste und meinte, dieses Problem hätte sich nun von selbst gelöst. Seit dem tritt das Problem jedoch recht häufig auf. So wieder letzte Woche vor dem MMI-Seminar: Eine Kommilitonin wollte wissen wann ich zum Seminar komme. SMS kamen nicht an und dann wieder alle auf einmal zur selben Uhrzeit (siehe Bild). This entry was posted on 6. Mai 2012 at 12:45	and is filed under Allgemein. Tagged: 540, Base, Bombe, Empfang, Eplus, GT540, Handy, LG, Problem, SMS, Verlust. You can follow any responses to this entry through the RSS 2.0 feed. You can leave a response, or trackback from your own site. This particular iphone app today crashes whenever I actually try and acccess this because the last update! I will not accessibility a few crucial pictures. Remember to tell me how to handle it to solve this kind of! I actually can’t get rid of these pictures! Grooveshark does recommend new music for your requirements depending on whats actually within your playlist in case you click on the broadcast key and don’t state any type. Even if I am running Mac, apple ipad in addition to apple iphone I need to say that this specific video tutorials with the survey search very fine. Grooveshark can would suggest music to you based on whats actually inside your playlist should you click on the radio station option as well as don’t influence some sort of genre. Can anyone make sure you explaine to me how you can take away the action menu from the elgg web page in addition to revise the quarry in addition to close friends web page because i will need. I must affect the format on the present if mentioned on the photo Good site this really is, I possess saved the idea within my internet explorer, cheers.